A new strain of haemorrhagic disease (HVD2) is now infecting rabbits in the United Kingdom. Often no symptoms just sudden death. The vaccine is available as an import from the EU until as such time as UK manufacturers can produce the vaccine. It is highly recommended rabbits are vaccinated against this new strain (HVD1 does NOT confer any immunity to HVD2). Contact the Clinic for further details. We recently very tragically lost TWO patients to this awful disease. It is a reminder that killer diseases are still prevalent and that it is vital that inoculations are kept up to date. Although inoculations are no guarantee of protection they are the best defence we have. In addition, if a pet does fall ill then antibodies go a long way to shorten the disease process and survival is far more likely. Many owners are foregoing vaccinations as they feel they are not necessary and are just promoted by money-hungry vets. Tragedy is a salutory reminder that lack of vaccinating is done at your pet’s peril. This disease is on the increase in UK. It is contracted by dogs eating slugs and snails. Usually this is a young dog/puppy behaviour so usually not much of a threat after 2 years of age, but vigilance is the key. Current recommendations are to prevent the disease by using a prescription spotton preparation or tablet monthly until at least 2 years of age. It is much easier to prevent the disease than treat it (often fatal). A decline in pet vaccination levels has raised concerns the “herd immunity effect” protecting UK small animals is under threat. 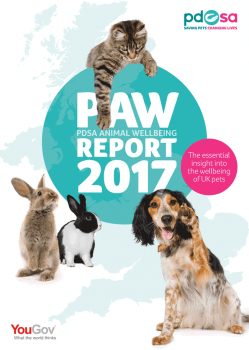 PDSA has published its seventhAnimal Wellbeing (PAW) Report. Headline figures in the seventh PDSA Animal Wellbeing (PAW) Report show only 75% of dogs (7 million) and 65% of cats (6.7 million) received a primary vaccination course when young. These are the lowest levels recorded by the report and compares with 82% of dogs and 72% of cats in 2011, when the survey began. Rabbit needs remain the most neglected, with only 50% receiving a primary vaccination when young – a decrease from 63% in 2016. Data also suggests, overall, only 66% of owners (5.6 million cats, 7.3 million dogs, 500,000 rabbits) surveyed in 2017 have protected their pet with annual booster vaccinations. Of those surveyed, owners expressed “cost” as one of the top reasons for failing to vaccinate their pet – 20% of both dog and cat owners and 10% of rabbit owners who hadn’t vaccinated their pets gave “too expensive” as their reason for not vaccinating. PDSA spokesman and vet Rebecca Ashman said: “The worry is, if there’s this fall in owners vaccinating their pets, there may be a drop in the herd immunity. We’re really worried there’s going to be pockets and outbreaks of diseases, which is heartbreaking for us [vets] when we normally know we can prevent them. PDSA head of pet health and welfare Nicola Martin added: “While the latest PAW Report confirms many of us get pets for the companionship and love they bring to our lives, it also highlights many owners continue to misjudge the costs involved in owning a pet.